First a preliminary. If you do not understand why economies can suffer from deficient demand, and why this is a needless waste of resources, then to be honest your best bet is to read a few chapters of a popular book on macro, like Tim Harford’s latest. If you have done a macro course and do not believe prolonged demand deficiency is possible, just tell me how you get out of a liquidity trap in a world with inflation targets after reading this post (and maybe this). Demand deficiency when inflation is persistently below target (the stagnation of the title) should not occur, because it is easy to solve technically. If I was a benevolent dictator in charge of both monetary and fiscal policy instruments, stagnation would never persist in my economy. The way I would ensure this most of the time is by varying interest rates, but if nominal interest rates hit zero (a liquidity trap) I have a whole range of alternative instruments, ranging from cutting various taxes to increasing transfers or raising public spending. I know of no macroeconomic theory on earth which tells me that everyone of these instruments will fail to raise demand. Whatever instrument I use to raise demand in a liquidity trap, I need to finance it. I can do this by issuing bonds (increasing government debt) or creating money. A higher stock of government debt or money is the only legacy (apart from happier people) of my successful operation to remove demand deficiency. We generally prefer governments to use bond finance, for reasons I will come to. But supposing there is some constraint (real or imagined) on issuing bonds. As a benevolent dictator I can just create money, which we call money financed fiscal stimulus. Money financed fiscal stimulus is a sure way of ending demand deficiency in a liquidity trap. If that higher stock of money proves too great later on when the economy has recovered, I can reduce it by various means. There will be no subsequent above target inflation. There are no technical problems that I as a benevolent dictator need to worry about here. Of course creating lots of money on a temporary basis is exactly what central banks in the UK, US and Japan have recently done (QE - Quantitative Easing). The problem is that they have not been accompanied by sufficient tax cuts, increased transfers or increased government spending. Creating money to buy financial assets is by comparison to money financed fiscal stimulus an unreliable way of raising demand. What stops this happening in the real world is that we have become fixated by the labels ‘monetary’ and ‘fiscal’ policy, and created an independent institution to handle the former. Central banks do monetary policy (varying interest rates and creating money) but are not allowed to give money directly to the people (helicopter money, or John Muellbauer’s QE for the people). Governments run fiscal policy, so can do bond financed fiscal stimulus, but are not allowed to create money. So a self-imposed institutional setup prevents either central banks or governments doing money financed fiscal stimulus alone. A major reason why this institutional arrangement exists is to discourage non-benevolent governments creating inflation through fiscal profligacy, or more recently in order to increase policy credibility. Of course during a period of stagnation there is no danger of rampant inflation. Unfortunately this institutional arrangement creates a problem when governments – in my view for largely imaginary reasons - put a priority on reducing deficits. Money financed fiscal stimulus is not available to get you out of a liquidity trap. So we get this huge waste of resources. Within the existing institutional framework, there is plenty to be done to convince fiscal policy makers that reducing deficits should not be a priority in the short term, or in trying to improve the monetary policy framework so liquidity traps happen less often. Yet it would be better still if we had an institutional framework which was a little more robust to failures on either front. We need to regain the possibility of money financed fiscal stimulus in a liquidity trap. What I say here has a lot in common with the advocates of Modern Monetary Theory. However, it also appears to be perfectly standard macroeconomics to me, so here I will simply commend them for highlighting these aspects of mainstream thought. Imagine that it was revealed that 10% of the European Union budget (the money that goes to the EU centre to fund the common agricultural policy and other EU wide projects) had been found to be completely wasted as a result of actions by EU policymakers. By wasted I do not mean spent on things that maybe it should not have been spent on (rich farmers, inefficient farmers, infrastructure projects whose costs exceed benefits etc), but literally money that went up in smoke. Imagine the scandal. Heads would roll, and some might find themselves in jail. 10% of the EU budget is about 0.1% of EU GDP. Yet sums at least ten times that figure are currently being wasted in the Eurozone, as a result of actions by Eurozone policymakers. 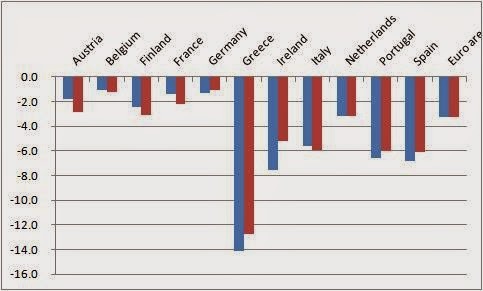 Here is the latest OECD assessment of output gaps across eleven Eurozone countries, for both 2013 (blue) and 2014 (red). A negative output gap means that output could be the amount of the gap higher without raising inflation above target. Of course Greece is a nightmare, and things in the other PIIGS are really bad, but the output gap in the Netherlands is around 3%, in France over 2% in 2014, and even in Germany the output gap exceeds 1%. Estimating output gaps is an imprecise science, but gaps of at least this size are consistent with inflation well below target (currently 0.3%). So output could be at least 1% higher across the Eurozone with no ill effects. This is the equivalent of the entire EU budget going up in smoke. Sometimes negative output gaps are the result of shocks which were not anticipated by policymakers (like the financial crisis). Sometimes they are engineered by policymakers to bring inflation down. It is unfortunate that these things happen, but they always have. However the output gaps we have in the Eurozone today are neither of these. Instead they have been created by policymakers for no good reason. That is why they can be called a scandal. At this point you might think I’m being unfair. Surely this is all about tight fiscal policy required to bring down government debt. I agree that it is all about fiscal policy, and in particular the crazy fiscal rules imposed within the Eurozone. However where is the urgent need to bring down debt outside the periphery? The OECD estimate that the primary structural budget balance in the Eurozone will be a surplus at around 1% of GDP in 2014 compared to a deficit in the OECD as a whole of just over 1%. So even if you think that we need austerity to bring deficits down rapidly - which I do not - why should policymakers in the Eurozone be doing this so much more quickly than in the UK, US or Japan? To achieve this goal, they are wasting resources on a colossal scale. If you think anything has changed as a result of Juncker’s ‘E315 bn’ investment plan, you should read this post from Frances Coppola. As she makes clear, there is not a penny of new EU money in this proposal. Instead money earmarked for existing projects is being used to provide insurance to private sector investment (which may or may not happen). There are so many issues with this kind of stimulus. Besides those raised by Frances, there is also the question of how to prevent firms simply getting insurance for schemes they would have undertaken anyway, and how exactly will the Commission select when to allocate its insurance. Those of a neoliberal persuasion who think government is bad at spending its money cannot feel any more comfortable with the government selecting what private sector projects to back. However a scheme like this will come as no surprise to someone like George Monbiot, who thinks states are increasingly being used to serve corporate ends. Equally embroiled in this scandal are those making monetary policy decisions at the ECB. Here I can simply defer to an excellent post by Ashoka Mody. In particular he points out why it is misleading to simply look at the ECB’s balance sheet as an indicator of the force of unconventional monetary policy. There is an important difference between creating money to bail out failing banks, as the ECB has done, and creating money to buy bonds to force down long term rates, which is Quantitative Easing (QE). He argues that the “ECB is set to remain—by far—the central bank with the tightest, most conservative monetary policy among the major central banks.” I thought I would quote the following paragraph in full, for reasons that will be clear to regular readers. As an institutional innovation, helicopter money has two major drawbacks in countries with their own central bank. First, why innovate when you can implement exactly the same policy through existing means: in macroeconomic terms helicopter money is equivalent to QE plus tax cuts when you have inflation targeting. Second, a fiscal stimulus in the form of temporary additional government spending is likely to be more predictable in its impact than transfers or tax cuts, because you eliminate the uncertainty caused by how much of the transfer or tax cut will be spent. But if countercyclical fiscal policy is effectively illegal in the Eurozone, these objections do not apply. QE for the people may have additional legal merits within the Eurozone. The ECB is constrained to some (uncertain) extent in its ability to buy government debt. But, as John Muellbauer suggests, mailing a cheque to every EZ citizen using electoral registers would seem to circumvent these legal difficulties. One objection to the ECB embarking on ‘QE for the people’ is that it goes well beyond the remit of a central bank. Yet the ECB appears to have no qualms on that score: besides routine references for the need for fiscal consolidation and ‘structural reform’, the letter discussed by Paul De Grauwe here shows the ECB requiring detailed changes to labour market regulations and institutions in Spain. So you have to ask why is it OK for the central bank to override the democratic process in this way, but giving money directly to the people is somehow beyond the pale. If you think that mailing a cheque to every voter in the Eurozone as a solution to continuing recession sounds too good to be true, then you have just rediscovered why recessions caused by demand deficiency when inflation is below target are such a scandalous waste. It is a problem that can be easily solved, with lots of winners and no losers. The only reason that this is not obvious to more people is that we have created an institutional divorce between monetary and fiscal policy that obscures that truth. It was a divorce that did a reasonable job in steering the economy in normal times, and it might discourage fiscal profligacy when demand is strong, but since 2010 it has led to a scandalous paralysis in the Eurozone. These losses are notional only, as the central bank is not in the business of making money. They matter only if they compromise the ability of the central bank to do its job of controlling inflation in the future. There are various ways that danger can be avoided, but my point here is that costs to the central bank can arise with any form of QE. Central banks routinely pass the profits they make (through seigniorage) to governments. So the innovation is that the central bank rather than the government decides how to disperse this money. Another objection is that, because the ECB is free to define its own targets, changing the monetary policy framework to target the level of nominal GDP would be a better innovation. I agree this would be a useful innovation. I would argue that it would be better still to allow countercyclical fiscal policy, because only this can deal with country specific shocks. But if, for whatever reason, these changes are ruled out, then a helicopter drop should be implemented. If you are a market monetarist, think of it as an insurance policy. Every five years or so all UK university departments get their research assessed in one gigantic peer review exercise, which is now called the REF. Each discipline is assessed separately, and scores can be used to compile a league table. The exercise has direct financial implications: the better the research, the more money universities get from the government. But if you know what academics are like, you will not be surprised to learn that those in the UK obsess about this exercise and its results to a far greater extent than the money involved would justify. The results of the latest exercise have just been published, and turned into league tables by Times Higher Education (THE) here. You could say that the REF now provides the same sort of incentive system for UK universities as profit does for a firm. In some cases academics whose research is below their departmental average are put under pressure to leave by one means or another, and most academics feel acutely the pressure to improve on how their own output will be assessed by this exercise. In contrast, poor performance in teaching or administration is not nearly such a serious issue. Many academics complain bitterly about the indignity of all this. An alternative system would be one where getting tenure was the last performance hurdle an academic had to pass, and from then on they were free to do what they liked. Research money could all be allocated on a project by project basis. I personally doubt that would be a better system from society’s point of view, and I do find it annoying how academics can complain so much about pressures that are taken for granted elsewhere. It would be a mistake, however, to think that the position in some REF league table told you all you needed to know to evaluate the quality of research in a department. The REF releases a wealth of data, and going beyond the headline number (usually the GPA score) can be informative. In the latest exercise departments were evaluated under three headings: outputs, environment and impact. Details about what is involved for each category can be found here. Outputs, which has the highest weight in the total (65%), looks at the quality of the four best recent publications of each submitted member of staff. The key word to note here is ‘submitted’. A department/university can choose not to submit all its staff to the REF, and by not submitting staff that a department/university considers are well below average it can raise its GPA score (if it gets its assessments right). So to the extent that staff are not submitted, the GPA will overestimate the average quality of the research done in that department. As I said, league tables normally just look at the GPA score . To some it may seem strange that this is allowed, but there are arguments to justify it. Departments do pay a significant financial penalty for leaving staff out - they only get money for submitted staff. To get a guide to the total amount of quality adjusted research done in a department, simply multiply the GPA score by the number of people submitted (called ‘power’ by THE). The decision about whether not to submit a member of staff is an agonising one  that involves many difficult trade-offs. To the individual not being submitted it is a nasty slap in the face. For the department, the perceived benefits in getting a higher position in GPA based league tables may outweigh the financial cost of not submitting staff members. Decisions on this front do vary from university to university, and from department to department: in economics, compare the third and fourth columns of the table below. Although it only counts for 15% of the total GPA score, the ‘environment’ heading may be of particular interest to potential PhD students. It is based on a number of different criteria, including the number of PhDs, the support provided for research, and research income from outside grants. Only three economics departments had all elements of environment judged to be of the highest (4*) quality this time: UCL, LSE and Oxford. Impact is a new category, accounting for 20% of the total. It is based on case studies where research has engaged with public, private and third sector organisations, or directly with the public. For example, one of Oxford’s case studies for economics was my own work on fiscal councils. A quick look at the results suggests that this new element has had a significant influence on the overall results. In economics, for example, the only department where all the submitted case studies were judged to be of the highest quality was Bristol. So while Bristol only came 12th= on published outputs, a strong impact and environment score lifted them to 6th in the overall ranking. As with any evaluation system, there are difficult judgements to make on the details, and these can lead to possibilities to ‘play the system’. Chris Bertram focuses on one particular issue at Crooked Timber. Each iteration of the assessment exercise attempts to change the details of the rules to avoid this, only to allow some new possibility to exploit the system. Partly as a result, after each exercise many academics feel that there must be a better and less time consuming way to judge the quality of research produced by individual academics or departments, but perhaps the fact that we keep returning to the same basic procedure suggests otherwise. Note that many economics departments are assessed under Business and Management, and are not included here. Sources: columns 2,3 and 5: Times Higher Education, column 4: HESA, columns 6-8, REF. THE publishes an alternative university wide ranking (aggregated across departments) that multiplies the GPA by the proportion of staff submitted, but that implicitly gives the research of non-submitted staff a score of zero, which is likely to be too extreme. It is better to simply note either the power score, or the proportion of staff submitted. Approximate information on the number of staff eligible for submission by department can be found here. This is based on my own experience at my previous university, where I was research director for the school. Thankfully I have played no role in these decisions at Oxford!